Chilean Francisco Lopez had a day to remember after winning his fourth stageof the race to move up to second in the overall standings. 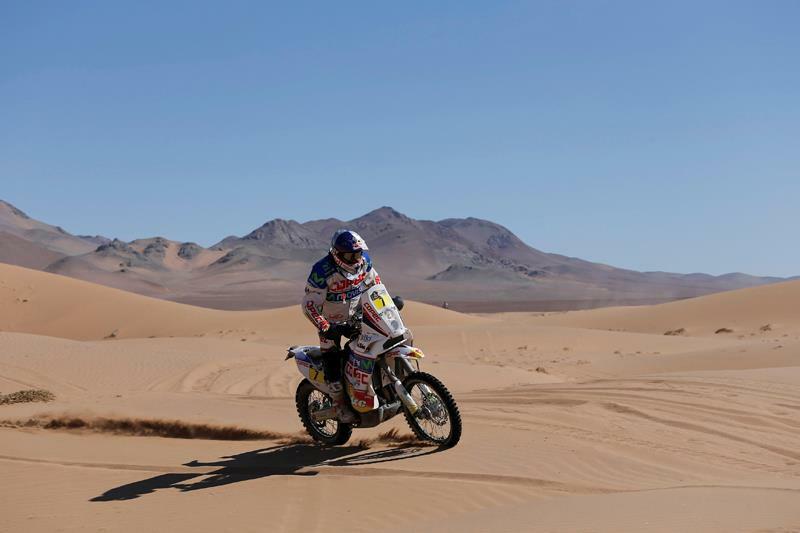 Lopez profited from a navigational error of former second place man Ruben Faria while showing the outright pace to beat Despres on the fast 441km timed special. He said: “Tomorrow will be a great day because the race will arrive at the finish line in Santiago. Personally I will be trying to get the best result I possibly can. Even before we finish I can already look back on some great moments at this year’s Dakar. I’m very content with the way things have gone for me. For Despres it was all about race management. Having started the stage in 14th place he had the advantage of having riders to chase and in the first half of the stage he rode hard battling for the lead with American Kurt Casseli and Lopez. In the second half he reeled himself in to finish the stage in second place losing 5m 25s to his closest rival Lopez.